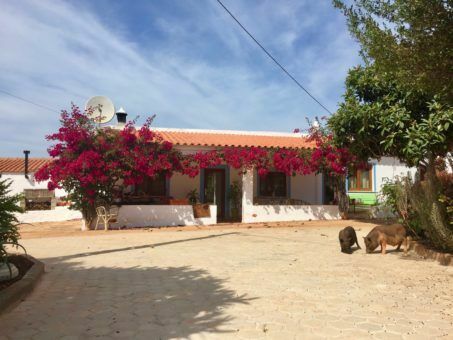 Welcome to our latest pet sit, a Portuguese farm house with a veranda framed by pink flowers. There are orange groves in the garden, a pool and never-ending sunshine. Each morning we stroll around the 30,000 square-metre grounds of our home for the week, followed by a friendly pack of dogs and pigs. How exactly did we end up in this slice of rural heaven? 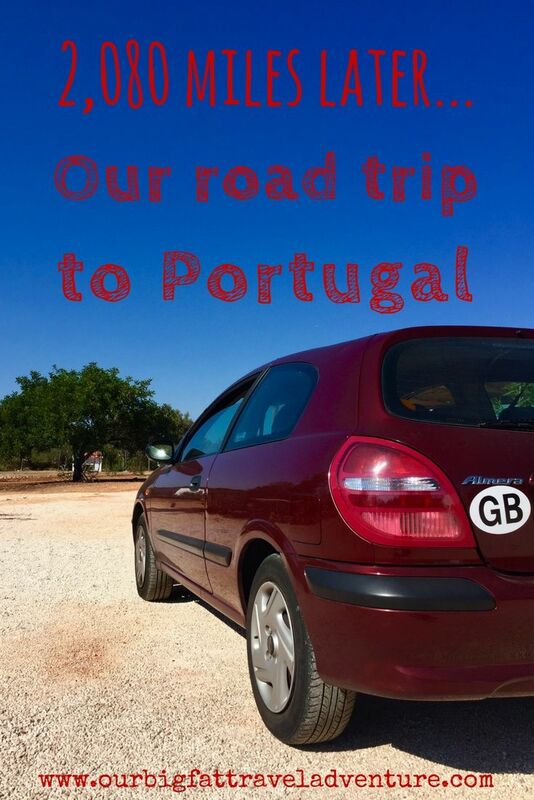 Let’s rewind 2,080 miles to the start of our road trip to Portugal. Is there anything better than the start of a new trip, the promise of new places and experiences? After three months in the UK the weather was taking on an autumnal nip and the leaves were beginning to turn, with them our desire to flee to warmer climes. We packed the car with shorts and coats, boots and flip flops in anticipation of both summer weather in Portugal and a wintery stay in Prague, then set off for the white cliffs of Dover. During the two-hour ferry crossing we sat up on the windy deck watching as we approached the shores of Dunkirk. After reaching France we drove into the sunset through Belgium to the Netherlands. It was dark when we finally arrived at our Airbnb in Weesp just outside of Amsterdam, a pretty town of cobbled streets and shuttered houses with a church. A windmill lay in the distance across a river lined with homes and boats. 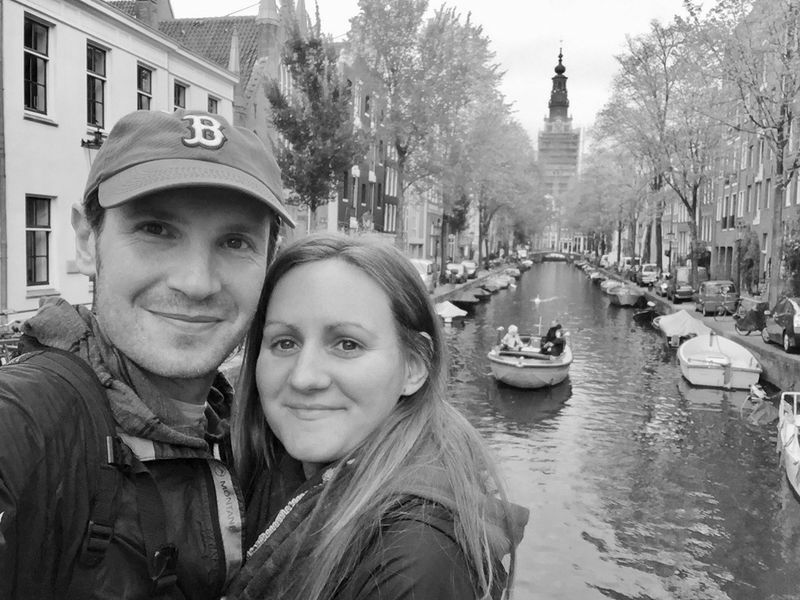 With less than 48 hours to explore Amsterdam, a brand-new city for us, we had to really get our tourist on. Thick fog obscured our first views as we wandered from Amsterdam Central Station through the streets, dodging herds of morning bicycles and trams. 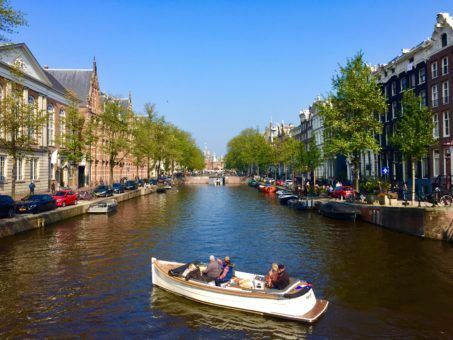 Amongst the tourist shops selling novelty clogs and Dutch cheese, we began to uncover Amsterdam’s charm, the countless canals lined with house boats, bridges decorated with flowers and parked bicycles, worn stone streets and pancake shops, grand palaces and cathedrals. There’s more to come in a separate post about our brief but packed trip to Amsterdam. However, highlights included a moving visit to the Anne Frank House, a boat trip along the canals, a free walking tour of the city and a catch up with our friend Loes, who we met whilst teaching in Vietnam and haven’t seen in over two years. 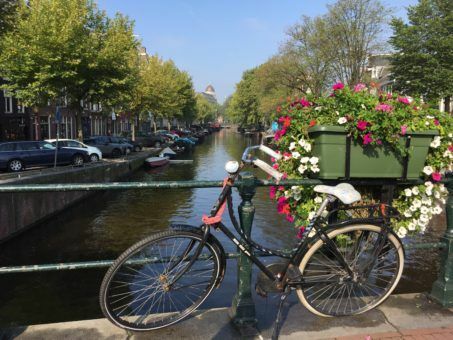 By the way, did you know that between 10-15,000 bicycles are fished out of Amsterdam’s canals every year? Just one of the fascinating facts we learnt about the city during our visit. It’s been a few years since we set foot in France and because we both used to take family holidays there as kids, it never feels like an ‘adventurous’ destination for us. Driving the length of the country though made me realise what beautiful, varied scenery it has, plus just how damn big it is. Our first stop was in Lille and having left Amsterdam in the late afternoon, we arrived in darkness and had little time to do anything but shower and sleep ahead of a long drive the next day. The eight-hour journey took us through fields spotted with wind turbines and tiny villages filled with white-washed houses and bakeries, down shady forest roads and along huge stretches of motorway. The trip was punctuated with supermarket stops for baguettes and hummus and we took turns to drive (with Andrew completing the lion’s share), whilst devouring podcasts and music playlists. 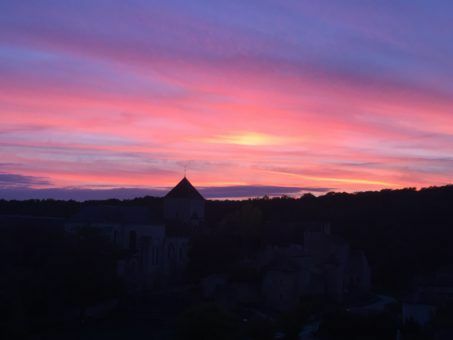 We arrived in Poitiers in time to see the sun setting in shades of pink and orange over the spires of the nearby abbey. What was left of the evening we spent chatting to two of the nicest Airbnb hosts we’ve stayed with, a young bicycle-loving couple with a cat who loves to open doors. 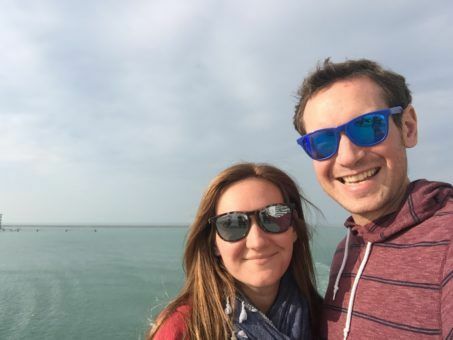 It’s hard to believe that it was just last year that we spent three months in Spain, attempting to set up a new life there and then dealing with the fallout when things fell apart. My youngest brother and his partner are currently walking the Camino de Santiago across Spain and I’ve been following their blistered but beautiful journey, marvelling at their Instagram snaps of yellow fields and golden sunsets. It made me think that perhaps I’d feel differently about Spain this time, that I’d be able to see its beauty more clearly than I had during those tumultuous months there when I’d felt like I was drifting in a sea of self-doubt and uncertainty. 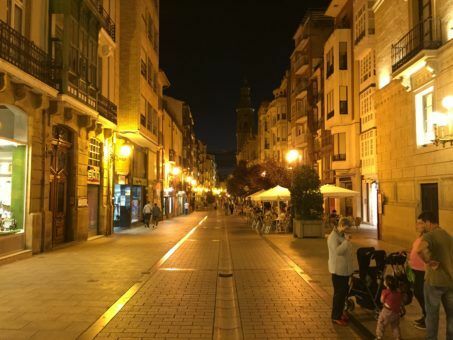 Unfortunately, during our brief stop in Logroño, where we stayed in one of the most disgusting Airbnb’s we’ve ever encountered, I sadly discovered that I still have quite negative feelings about the country. It’s not Spain’s fault, I just can’t connect with the place and feel haunted by the mental difficulties I faced there. Thankfully, I felt that shadow lift as we drove over the border to Portugal, where we were greeted by buttery sunshine. We drove straight to the university city of Coimbra and our digs for the night with Fatima, a smiling Portuguese woman who embraced us warmly and welcomed us with tea, cookies and fruit. With his Spanish language skills, Andrew found that he was able to understand much of what Fatima said to us in Portuguese, a good sign for the next six weeks we’ll spend here in the country. 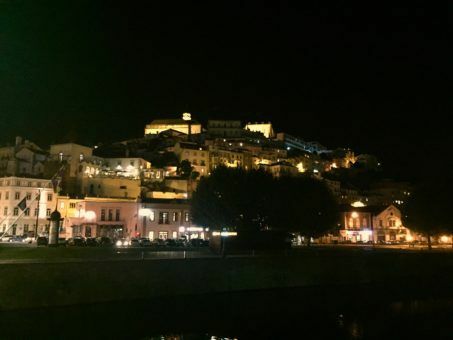 We had just a few hours that evening to explore Coimbra, a fort-like town perched on a hillside overlooking a river. 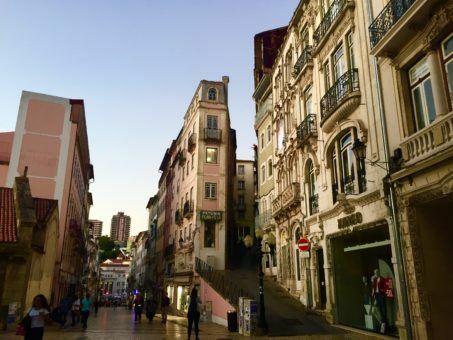 Steep cobbled streets wound upwards, dotted with tapas bars and shops selling huge meringues and pasteis de nata – Portuguese custard tarts. I can’t be certain, but I think we may have stumbled upon freshers’ week, as the streets were filled with students, some dressed in their long, black cloaks singing and laughing, playing drinking games and trawling from bar to bar. 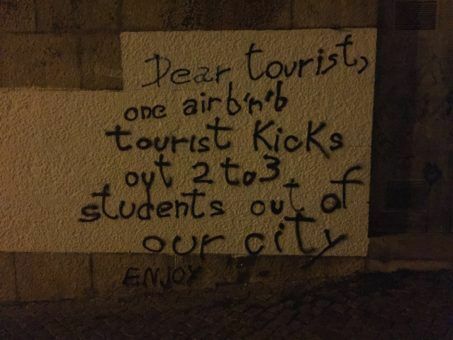 On some of the walls, we saw scrawled messages proclaiming: ‘to be or to Airbnb?’ and ‘one Airbnb tourist kicks out two to three students from our city – enjoy’. A disconcerting message and an issue I plan to write about soon. So, 2,080 miles later here we are at our final destination, a rural house sit near Lagos in southern Portugal. We feel fortunate to be here enjoying this stunningly renovated house in a place where the sun shines reliably every day, the only noise comes from nearby farmers and barking dogs and we can sit on the veranda, peacefully working or eating a meal. So far, Portuguese life definitely agrees with us! 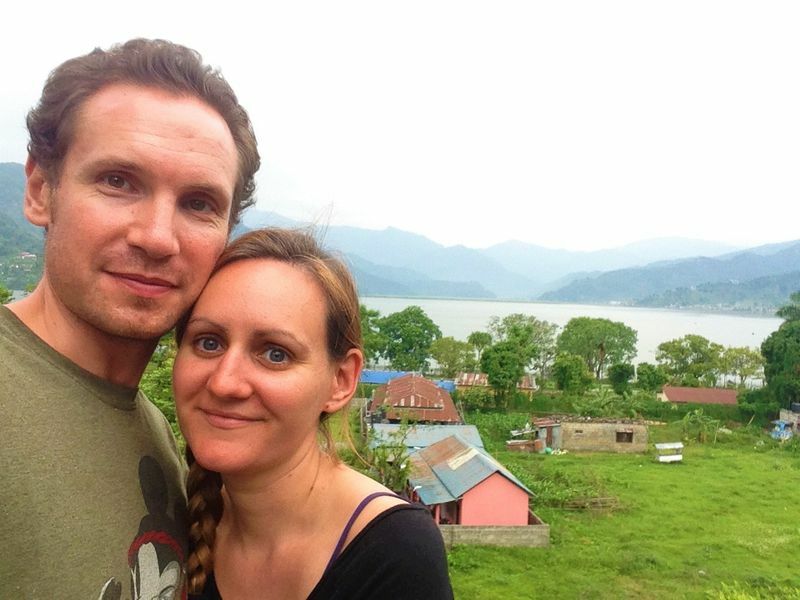 More to come about our incredible house sit, including trips to nearby sandy beaches, countryside towns and deserted dams. We’ll also be sharing some tips on how you can land yourself a house sit just as amazing as this one. Hi Gilda, the sunshine is making a hugely positive difference to my mood! I think it’s becoming a big issue that landlords are realising they can charge a lot more for short stays on Airbnb than renting long-term to locals and this is causing a bit of a housing shortage in some places, which is a real shame. In western Europe we often can’t afford hotels on our budget so Airbnb is a cheaper option, yet we know it’s maybe not the most ethical – a hard dilemma. I am looking forward to reading your post about the Airbnb issue. We keep running into issues with Airbnb restrictions imposed by various cities. We had a booking cancel in Amsterdam after an Airbnb crackdown. Then we couldn’t get a place in Berlin due to the city ban. We have a stay in Vancouver, Canada coming up that we were allowed to get only because we were staying more than 30 days (no Airbnbs less than 30 days allowed). And we are cancelling a two-month stop in Victoria, Canada because Airbnb legislation is pending and the owners are all scared to take reservations right now. I understand the backlash against Airbnb and tourism in general, but I wouldn’t want to travel if I had to stay in hotels. I want to do the right thing too. It’s a very difficult dilemma. I’m looking forward to reading your opinions on the topic. 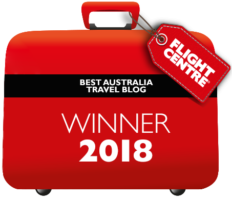 Hi Nikki, thanks so much for your comment, it’s so interesting to read about your Airbnb experiences I may quote your comment in my post about it if that’s ok? I understand the backlash too but I also agree with you, we wouldn’t be able/want to travel and work as we do now without Airbnb – it’s a real dilemma. Of course you may use my comments. I can’t wait to read the post. The topic is so very relevant to a travel lifestyle, yet so many travelers seem unaware of the issue. Glad to hear your brother is making the trek on the Camino. There are days – while here in Porto – that I think about walking from Porto to Santiago, Abi and I have considered it for the past couple of years. But I think my reality is that one Camino trek is good for me. Funny, you stopped in Logrono. We walked through the city and are our lunch on a park bench. The city was super pretty and we wished, at the time, that we had time to stay rather than just walk through. One day, you’ll connect with Spain. We just spent 10 days in Malaga, on the sea, and it was beautiful. The cool ocean breezes were exactly what we needed after traveling by train for 8 weeks. Maybe Malaga is where you’ll find peace with Spain one day. ‘Glad you enjoyed your road trip to Portugal. It must have been such an interesting journey. I’ve driven from England to Germany when I first moved here as an expat, and from France to Germany after finding a flight for €18.00 to Paris! And when I say “I drove,” I mean, my husband did! When I first went to Lisbon in 2007, I was amazed to find so many young Americans in the city for “Spring Break!” Apparently, New York is just 6 hours away, and is on the same time-line as Lisbon! Moreover, it’s quicker, cheaper, and nicer, to fly to Portugal than it would to other parts of the US! Re – the Airbnb thing has become a sore issue in Berlin too, such that a new law was made forbidding people to use their private rental as a commercial venture. Apparently, it was to do with residential properties and neighbours complaining about the constant noise derived from wheels of suitcases ‘cos most buildings have cobbled stones in their backyards, and people couldn’t sleep with the coming and going! I don’t use Airbnb myself, but I sympathise with the student dilemma, as it’s more lucrative to rent to tourists than to locals. A few days ago, there was a news feature about an apartment (where I live in Berlin) coming on the market, and 800 people turned up wanting to be prospective tenants. 800 people! I’m thinking of doing a road trip from Belgium to Portugal (Faro). Just wondering how the roads were. Belgium and France I know. But Spain and Portugal, when you take the autoroutes, I hope there are no scary windy mountain roads / passes to take. Any advice on what roads to take would be great! Amsterdam was seriously one of the most beautiful cities we’ve been to – well worth a visit!